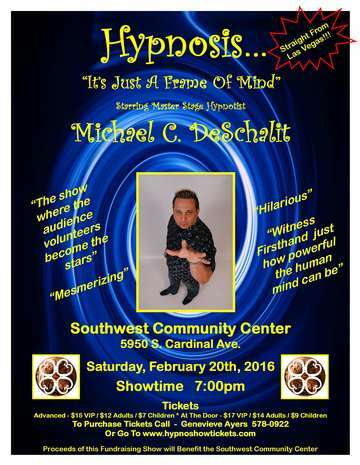 On February 20th, 2016, The Southwest Community Center will play host to a Comedy Hypnosis Show Fundraiser starring Master Stage Hypnotist Michael DeSchalit. Michael DeSchalit is a World Class Hypnotist who was trained in this art by none other than the Father of Modern Stage Hypnosis and Dean of American Hypnotists, Dr. Ormond McGill. Michael has over 20 years of professional performance experience and in addition to comedy hypnosis, he is a Multi-Award Winning Magician who has performed in venues such as The RMS Queen Mary, Hollywood’s World Famous Magic Castle and the Treasure Chest Casino in New Orleans. He has appeared in exclusive engagements at the Tropicana, The Circus-Circus, The Riviera, and most recently Starring in his own show at The Orleans Hotel and Casino in Fabulous Las Vegas. The show is a fundraiser for the Southwest Community Center. This event is going to fund the many different programs that the Center offers to the community. This show is a high energy show where audience volunteers become the stars of the show by acting out wild and crazy routines using only their imagination. The show is appropriate for families with children. Showtime is Saturday, February 20th, 2016 at 7:00pm at the Southwest Community Center which is located at 5950 S. Cardinal Ave, Tucson, AZ, 85746. You may purchase tickets in advance from the Southwest Community Center by contacting Genevieve Ayers at (520)578-0922 or by going online to www.hypnoshowtickets.com. Advance purchase tickets are $7.00 for Children, $12.00 for Adults and $15.00 for VIP’s. Tickets may also be available at the door the evening of the show and are $9.00 for Children, $14.00 for Adults and $17.00 for VIP’s, but because there will only be one Show, tickets will be subject to availability.